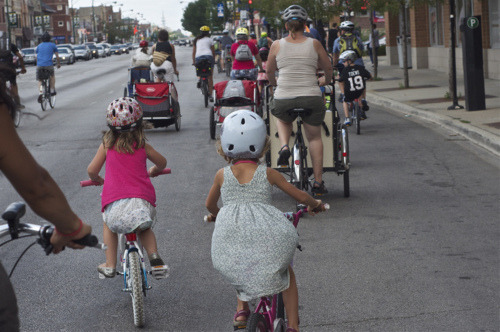 Children and their parents ride on the streets of Chicago in Kidical Mass, on August 13, 2011. Photo by Ash Lottes. Kidical Mass is coming up this Saturday! “Kidical Mass is a slow-paced group ride for families with kids of all ages.” It started in Eugene, Oregon, in 2008, and spread across North America (there are two in Canada) and Hungary. In Chicago, the ride happens every month, year round, on the second Saturday, starting near the playground in Palmer Square Park at 10:30 AM, rolling at 11 AM. 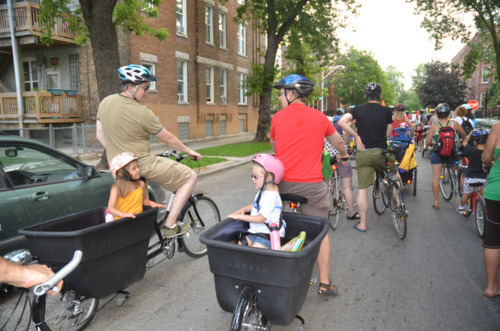 I haven’t ridden with the families yet, but Ash Lottes, a Logan Square mom and passionate Kidical Mass promoter gives the scoop of Chicago’s ride on her blog, One Less Minivan. Saturday’s Kidical Mass was another big ‘un. In early August I was able to coax some friends at a couple of our local community gardens to show the kids around, explain what makes their garden special and a bit of history about their funding and origins. Like every month, we gathered in Palmer Square Park at 10:30 and rode a loop around the jogging path to get our young cyclists acclimated before setting off for our first stop: Whipple-Dickens Community Garden. My lovely next door neighbor Ryan was already there donning his Farmer John attire and ready to wow the kids with the perennials and edibles held within the bounty of the garden. Read One Less Minivan for the rest of the article and to see all the photos from the event. If there are Grid Chicago readers outside of Chicago interested in starting a family-friendly, group bike ride, it seem it’s as easy as inviting fellow parents and neighbors on a short ride from home to a nearby playground, pool, or ice cream shop (Ashley and the Kidical Mass website both recommend having a fun destination). You can get in touch with the Chicago Kidical Mass group via their Facebook page, or I can put you in touch with Ash if you’d like some advice. Two friends and their dads enjoy each other’s company from the buckets of their respective Madsen bikes. Photo by Ash Lottes. It would be great to see a Kidical Mass ride launch in five more Illinois cities within a year. Such a ride will help transform your community into being more bike friendly and can educate your children about riding safely through town, eventually encouraging them to ride a bike to class or to the park. Representin’ with a Kidical Mass spoke card, in Atlanta, Georgia. Photo by Jonathan Woodruff. This is a great opportunity to introduce the Cargo Bike Roll Call, happening in six days on Monday, September 12, 2011, at West Town Bikes (1147 N Campbell). It’s for people of all ages who want to see the variety of cargo and family bikes as well as cargo setups. Think of a local lowrider or antique car show where owners pop the hood and show off. You don’t need a cargo bike to attend. Does kidical mass promote proper recognition of rules of the road (unlike it’s older uncle, Critical Mass)? I think Critical Mass is like Kidical Mass’s step-great-great-uncle. The relationship is so far away, it doesn’t mean much. “Is this just like Critical Mass but with kids?